Aloha everyone! Our churches are open to welcome you all – come and worship with us. Please visit one of our churches that is nearest to you, and you will experience the presence of God through our love and fellowship. Thank you and if you have any questions, please feel free to contact us. 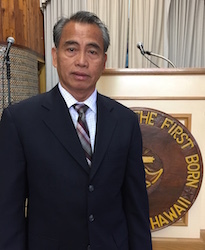 Pastor: Dr. Mitchell Kanekoa, Jr.
Pastor: Rev. Bernard Nuesca, Jr.